As they open the show and provide commentary throughout, the trio of Alicia Britton, Falicia Cunningham, and Jill Iverson are fabulous! They can all belt, and their doo-woppy harmonies are delicious. Ty Hudson is so adorable as our Seymour that you don't mind when he starts killing people. What else can he do? Perhaps the best work in that campy tone comes from Courtney Groves, whose Audrey is all exaggerated looks, eyelash flutters, quick tiny steps in tall heels, and dramatic pauses. And that voice! She and Ty sound fantastic and make a charming couple to root for. 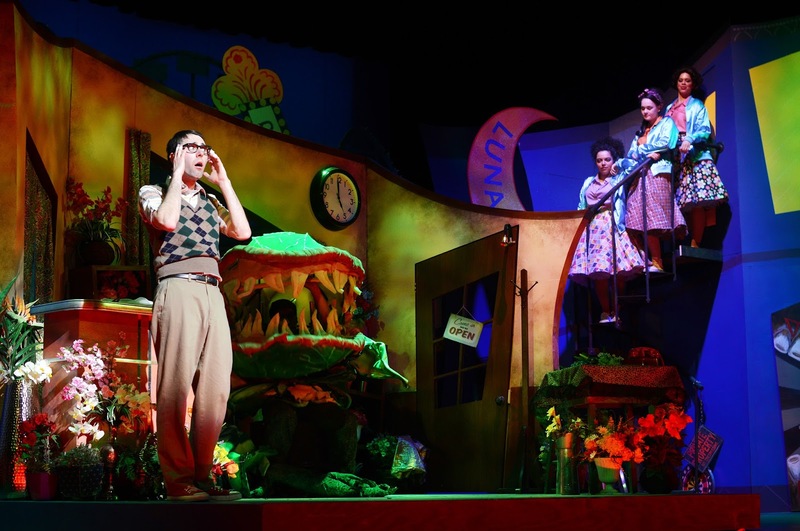 There's not a weak link in this small cast, which includes Philip C. Matthews doing some outrageous comedic work as the sadistic dentist and several other extreme characters; Brandon Jackson who puts such gleefully evil expression into the voice of Audrey II that it doesn't matter that you can't see him; and Michael Fischetti as the lovably gruff Mr. Mushnik. Although there are no big splashy dance numbers, director/choreographer Joe Chvala has infused the show with constant movement, and the trio particularly performs many great back-up dancer moves throughout the show. 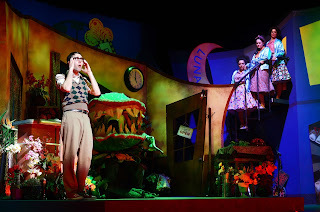 The set, described by the director as "a mash up of Coney Island, b-movie memorabilia, and even a '60s movie house" and designed by Eli Schlatter, is really charming. There's a smaller stage that moves forward to center stage upon which sits the tiny flower shop, the backdrop is full of colorful movie and amusement park posters, and there's even a roller coaster! Not to mention the ever growing in size Audrey II puppets, equally cute and terrifying (with larger versions manipulated by puppeteer Charles Goitia). Ed Gleeman's colorful '60s costumes are perfectly retro and campy, just like the show. Despite the wacky and dark plot, there's a really sweet heart to the show. Everyone can relate to the idea of wanting more, of wanting to be happy, which is all that Seymour and Audrey want. 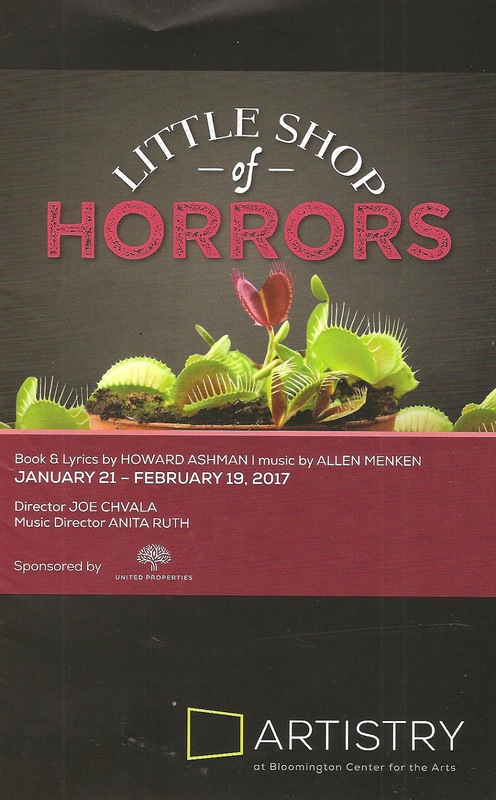 The score (music by Alan Mencken and lyrics by Howard Ashman) is full of too many catchy songs to mention (including one of my all-time favorite musical theater songs "Suddenly, Seymour"). That great '60s sound is brought to life by the cast and music director Anita Ruth's nine-piece pit orchestra. In times like these, it's good to be reminded what happens when you make a deal with the devil. Don't feed the plant! 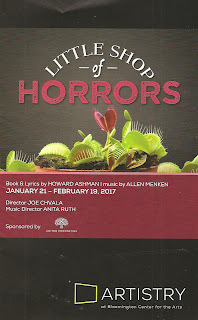 *Plot summary borrowed from what I wrote about the 2014 production by 7th House Theater.